The 1973 fuel shortage and the first antipollution measures enacted in the US sounded the death-knell of dirty, gas-guzzling two-strokes. Yamaha, which up to then had specialized in two-stroke bikes, reacted swiftly. From 1976 it offered a coherent, yet diverse, upper range with single- (XT500), twin- (XS500) and three-cylinder (750) four-stroke power units. The XS5OO was an extension of the famous RD350, epitome of the mid-range sports bike. It incorporated a number of refinements rarely seen at that time, such as an eight-valve head. This oversquare twin was mounted in a frame of classic construction. with disc braking and the novelty of cast light-alloy wheels. engine's power. Though it suffered from poor pickup at low speed, plus a slight mid-range flat spot, the engine could quickly spin up to a spectacular rate of rotation thanks to its low inertia, and was powerful and quicktempered when the heat was turned up. 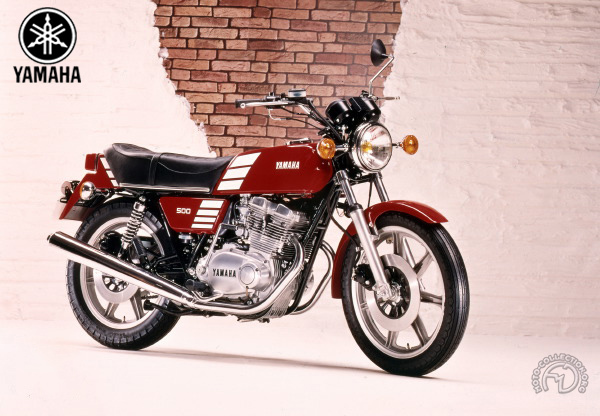 For a first attempt, Yamaha had done really well, and the XS5OO established itself from the outset as a medium-displacement machine that was both well-balanced and brilliantly executed. Sadly, it was not always totally reliable. With its angular lines, satin paint work and cast aluminum wheels, the Yamaha XS500 set new styling standards for high-perfomance twin-cam sports bikes.